My only child, Matthew James, is a very special little boy. Born in November of 1999, I lost him to non-verbal Autism in February 2001. He's the greatest joy of my life, although my heart still aches with hope for his life. Matthew lives on the periphery of our world, only interacting with me or other members of our family when he wants to, or when he needs something. He's a very good little boy, but I long for him to be able to engage with his us and other aspects of our world more appropriately and comfortably. Inspired by the idea of Animal Assisted Therapy, especially those dogs who are now being trained for children with Autism, I felt strongly that this complimentary therapy could make a difference in his life. 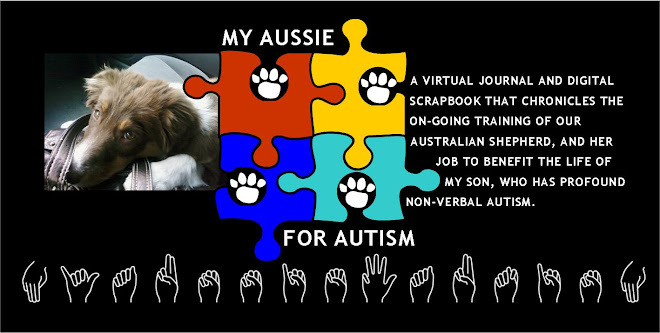 Unlike other families who wish to obtain an Autism Service Dog that has ALREADY been trained, and therefore a much more significant investment upfront, I felt the best option for our family - most specifically the best option for my son, was to get puppy that could grow and learn WITH him. I knew I could inspire Matthew's interest in a dog more successfully, if he's given a longer period of time to become accustomed to one. From the day to day acclimation that would be required, he'll come to understand that a puppy learns and grows as he does - and can become a valued member of our family! And so, I'd like to introduce you to Amistad's Falen aka "Pippi" our special dog for our special needs. Aussie's are known for their high level of intelligence and their strong desire to "work." I fell in love with the breed when I worked in an Assisted Living community and met "Buddy," a four year old Australian Shepherd who belonged to one of our residents. He still lives with her at the community in the special wing dedicated to residents with memory impairments. He has a wonderful personality, and it was evident that he thoroughly enjoyed visiting with all of the many people he came into contact with everyday. In an article from Psychiatric Times, "Therapy with children now part of a dog's life," (which I've also included in our blog's navigation to the right) Child and adolescent psychiatrist Rachel Fleissner, M.D., has two trained dogs assisting her in therapy with children diagnosed with mental and developmental disorders. Those dogs are Australian Shepherds! 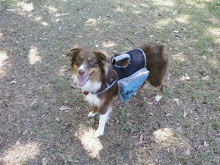 Because Australian Shepherds are "sight dogs," they are masters at reading body language, said Fleissner. 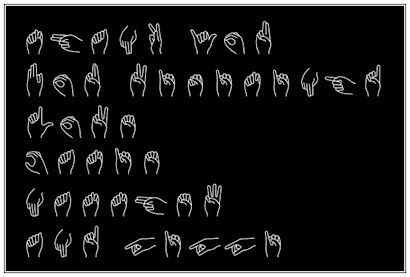 Having a child who is non-verbal means having to suffer through a crash-course in reading body language! 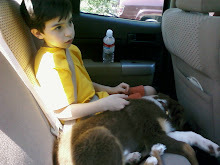 After much research on the topic of Autism Service Dogs, I knew that the Australian Shepherd breed was going to be a good fit for my son and me. So much to share about the last seven months! Life has been hectic,busy,heartbreaking,challenging,and yet strangely calming and fulfilling - ALL at the same time! Pippi and Matthew's relationship has grown and with it have come the hurdles we face in any relationship. I had to know that it wouldn't be THAT easy! I'm dealing with a dog, and an energetic one at that, as well as a child who is not able to speak verbally. I'd be a fool to think that this "honey-moon" phase would last forever. Meh! Pippi has been especially happy to be living (full-time now) with the greater pack - which included Annie (my parent's beloved Field Champion English Cocker Spaniel) and Rowdy (my parents first foray - before they new any better - into Australian Shepherds. So shhhhh...don't tell him that he's actually a "mini" - because since Pippi has come along, he looks and acts like a full-fledged Aussie!!) She thinks all of the cats exist only for her "herding" pleasure and happily keeps them indoors where they're supposed to remain, albeit THEY are not always happy about that! She's mastered the art of Flippy Floppin' Fun - and can catch her Flippy in the air with circus like acrobatics that rival the skills of the best Flying Disc dogs. Methinks we see a VERY interesting development for her and Matt in the future!! And typical of my over-active imagination, I started to envision how I could develop an "recreational engagement program" for them that could be a template for future endeavors. I call it "Palz with Pawz." More to come on that later! We give dogs time we can spare, space we can spare and love we can spare. And in return, dogs give us their all. It’s the best deal man has ever made. Pippi is still growing into her amazing versatility! Not only does she engage my son into interaction, but she's my special friend too! We're currently working on daily recreational activities between us three. I'm going to include links to the items I've acquired for our special outdoor fun. Everything from multi-colored cones, to a diverse array of "fetchable" items, to the very best kind of flying toys! Stay tuned for more information!! Matt and Pippi after our first day at the park together! What is SO profound about this moment is that, not only is he allowing her to lay beside him and rest her head on his lap, but he is voluntarily petting/touching her. This behavior is second nature for most of us, but miraculous and monumental for Matthew! My faith and continued hopes have taken flight! Physchiatric News: "Therapy with children now part of a dog's life"